I'm a Staff Scientist at the Spitzer Space Telescope / Science Center, and a member of the InfraRed Spectrograph Instrument Support Team. My research interests center on the interstellar medium of our Galaxy. I have studied cloud structure and chemistry, and specialized in the class of nearby molecular clouds called the high-latitude translucent clouds. For an introduction to these concepts, see the introduction to my thesis, published in 1999. My most recent work involves quantitative measurements of the structure of extended emission in the Galaxy measured as part of the Spitzer Galactic First Look Survey. 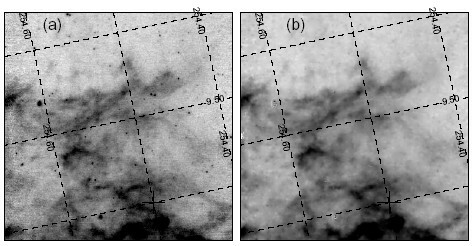 The initial analysis of a field in the Gum Nebula (see Fig. 1 below), where we first measure a break in the 24/25 micron power spectrum, was published in Ingalls et al. 2004. We believe the power spectrum break represents the transition from a 3D structure at small scales to a 2D structure at large scales. This is evidence that the medium is stretched into thin sheets, possibly by supernova explosions. Analysis of all 10 survey maps finds many cases of a similar break. In addition, the medium appears isotropic (the spectral statistics look the same from all directions). We speculate that all diffuse H i gas is arranged into statistically isotropic sheets that follow Kolmogorov scaling (see Ingalls et al. 2005). Of interest to extragalactic astronomers may be the confusion noise analysis that I contributed to Burgdorf et al. (2005). Figure 1: Power spectral analysis of a field in the Gum Nebula centered near Galactic position (254.5, -9.5). (a): Original post-BCD MIPS 24 micron mosaic. Gray levels range from 19.1 (white) to 20.8 MJy/sr (black). (b): the results of point-source subtraction and noise filtering on (a). 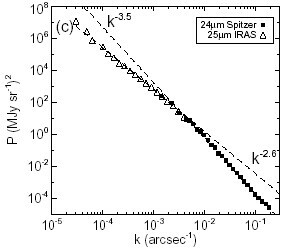 (c): Spatial power spectra at 25 microns (open triangles; IRAS) and 24 microns (filled squares; Spitzer) for the field encompassing (b). The 25 micron spectrum has been normalized to intersect the 24 micron spectrum. The data have been rebinned in equally spaced logarithmic intervals for clarity. Separate power-law fits are superimposed on the spectra. See Ingalls et al. 2004 for more details. In my spare time I enjoy playing with fractals, those beautiful objects from theoretical mathematics. There are two kinds of fractals, deterministic and random fractals. The Mandelbrot set is the most commonly seen deterministic fractal. I focus much of my time working with a type of random fractal called fractional Brownian motion because it seems to describe the geometry of interstellar clouds quite well. To download my IDL code that you can use to make images of the Mandelbrot set, Click here. Zuzana Gedeon, of the Montana State University Department of Computer Science, described fractional Brownian motion succinctly. Mandelbrot's fractal geometry has found a wide variety of applications. The statistical self-similarity of fractal shapes is inherent in the natural world and may be exploited to simulate natural processes. In particular, random fractional Brownian motion (fBm) corresponds to fractal landscapes and occurs widely in nature, accurately describing such phenomena as pitch variation in music, flicker noise in solid-state devices, and 2-D mountain landscapes. FBm is simply a sum of randomly phase-shifted sine waves, the amplitude of which varies with frequency as 1/fß for 1<=ß<=3. FBm has a jagged trace which resembles the skyline of a mountain range. Mandelbrot observed this and reasoned that extending the function to two (-point-something, if you insist) dimensions would result in a surface resembling mountainous terrain. He did so and presto! fractal mountains were born. Click here to download my IDL code that you can use to make images like the ones below. A different value for ß gives an image that looks like a typical starforming region. The technique can be expanded to three spatial dimensions, plus a separate cube for radial velocity to simulate real spectral lines. This method is described in the Miville-Deschênes et al. reference (below). Qian, H. et al, "On two-dimensional fractional Brownian motion and fractional Brownian random field" 1998 J. Phys. A: Math. Gen 31(28) L527. Discusses the mathematics of 2D fBm. Stutzki, J. et al. "On the fractal structure of molecular clouds" 1998, Astron. & Astrophys., 336, 697. Excellent discussion of fBm structures in the interstellar medium. Explains the relationship between the various fractal and other power law indices used to describe interstellar structure. Lots of detailed image-processing theory, with practical tips on how to simulate fBm images. Very useful. Miville-Deschênes, M.A., Levrier, F., & Falgarone, E., "On the use of fractional Brownian motion to determine the 3D statistical properties of interstellar gas" 2003, ApJ, 593, 831. This paper picks up where Stutzki left off, constructing cloud density and velocity fields using 3D fBm models, and "measuring" the statistics an astronomer would observe in spectral line data cubes.